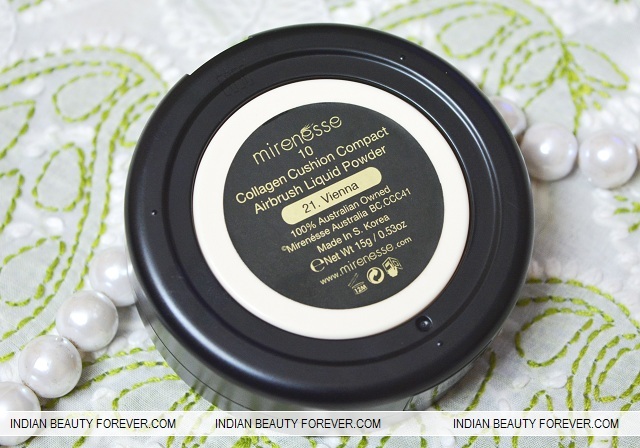 I will review Mirenesse 10 Collagen Cushion Compact Airbrush Liquid Powder Foundation. 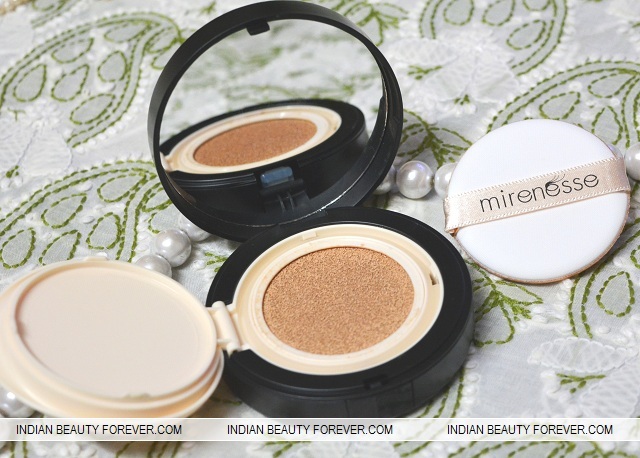 If you may have seen my Luxola haul post then I showed this foundation along with few other Mirenesse products. Mirenesse is an Australian brand which is available on Luxola.com along with many other brands like Sleek, Real Techniques, etc. 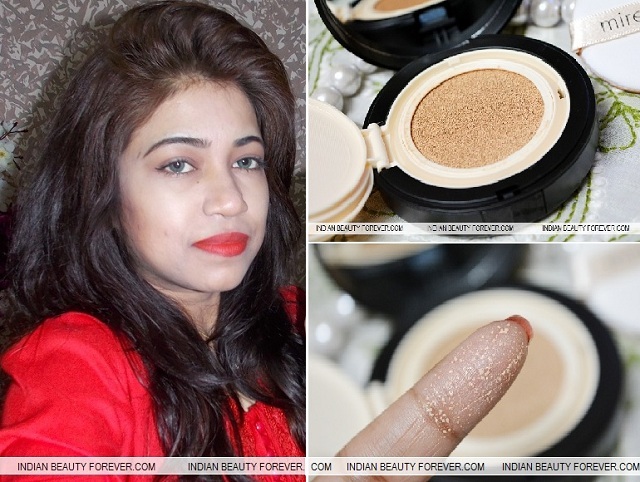 This foundation is a cushion effect foundation and my first such foundation. By that I mean, when you press the sponge cushion-y top then the liquid foundation will come over. 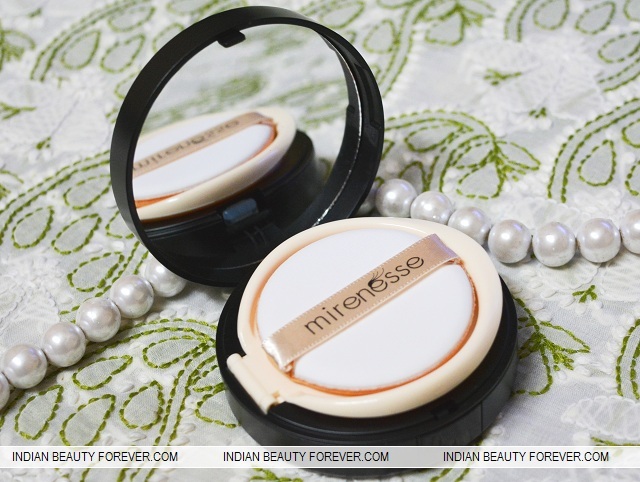 Price: This Mirenesse 10 Collagen Cushion Compact Airbrush Liquid Powder Foundation is priced for 3500 Rupees approximately. Shades: there are 4 shades for this foundation namely Vanilla, Vienna, Mocha and Bronze. This foundation has a very classy looking and user friendly packaging. The kit includes a mirror, a top section for keeping the sponge applicator and the bottom which has the liquid powder foundation. This can be used by the sponge or a brush. I like to use this with a foundation flat top brush. I just press the brush lightly over the spongy surface and the brush will get laden with the product. Then I could gently buff the foundation over my face. This shade Vienna is a couple of shades lighter then my skin tone which you can see in the picture. I just applied a very fine layer and it looks slightly ashy. 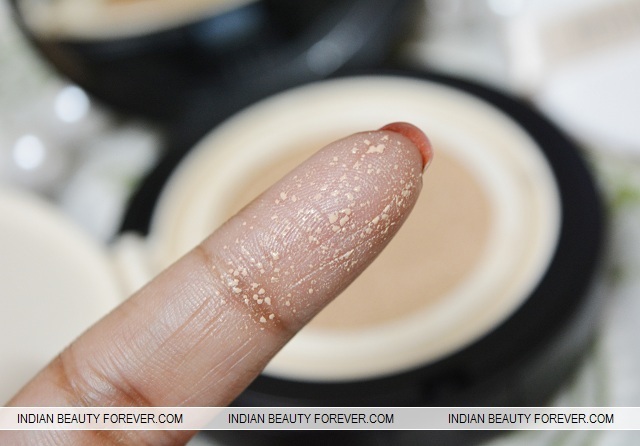 The foundation has a liquid consistency and I don’t know why it’s been said as the powder since it doesn’t transform into a powdery satin finish. It is more like a medium to high coverage foundation. The finish is good and won’t feel heavy on the face. I feel that blending this foundation with the fingers or with the sponge is a little tricky which is why the brush works the best. I used it just twice since the color is lighter to be worn for the day time. So, I used it for a wedding function and quite liked it. It controlled the oils on my skin yet is quite hydrating. I liked its staying span and the way it covers the flaws. It says that it has an airbrush finish which it has surely. 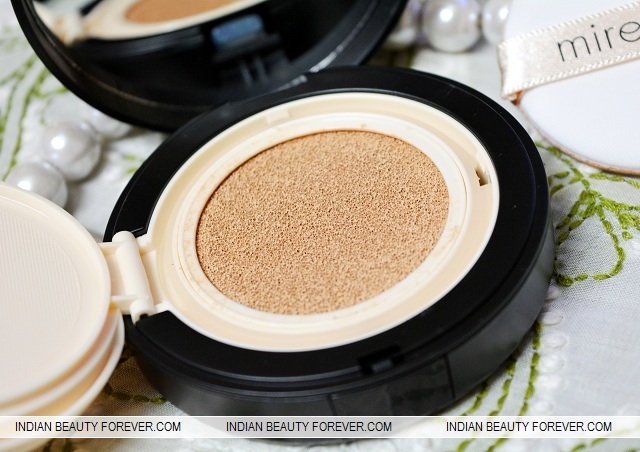 It goes into the pores to give a smoother velvety finish. Moreover, the foundation has collagen infused formula which also protects and repairs the skin till the time this product stays on the face. It also has an SPF 25 which is good amount of sun protection. I don’t need a primer before using this. At least for my oily skin. 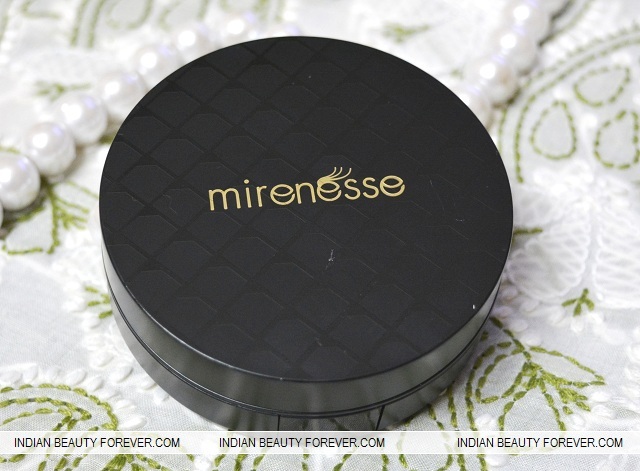 Mirenesse 10 Collagen Cushion Compact Airbrush Liquid Powder Foundation comes in a beautiful case which a mirror, sponge and the cushion foundation which applies smoothly though is slightly difficult to blend. After the blending ,it doesn't feel heavy on the face and is ideal for getting a medium to heavy coverage. This is only available in 4 shades and is expensive. Finish of this foundation is velvety and airbrush like which controls oils for a lot longer and a little bit is enough for the entire face and neck. If you don't mind the price then try it or skip it. 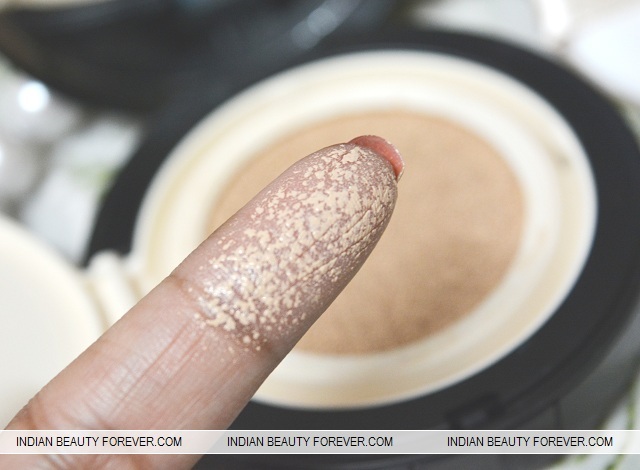 I feel that this foundation has the same finish and feel as that of the Maybelline liquid mousse foundation.